Recent studies have shown that a significant percentage of the US population is not meeting the recommended intake of magnesium. Nevertheless, magnesium deficiency is often undiagnosed because the health impacts can be very subtle. This webinar will examine the role of magnesium in health and disease. 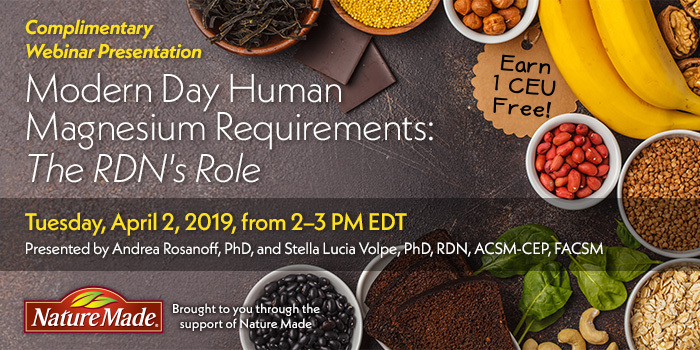 Leading experts Andrea Rosanoff, PhD, and Stella Lucia Volpe, PhD, RDN, ACSM-CEP, FACSM, will provide an updated review to help RDs better assess clients’ magnesium status in relation to age and gender, help clients adjust magnesium intake, and make appropriate recommendations for magnesium supplementation. 1. Discuss the low magnesium status of age/gender groups in the United States. 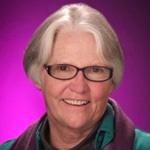 Dr. Rosanoff received her PhD in nutrition from the University of California at Berkley, she served as Senior Chemical Information Specialist at Dialog Information Services and as Information Analyst at Chevron Research & Technology Corporation. She is currently an independent scholar with expertise in Nutritional Magnesium. Dr. Rosanoff is the co-author of “The Magnesium Factor”, a book on magnesium and heart disease, and has conducted original research for publication in scientific journals. In 2005, Dr. Rosanoff formed the Center for Magnesium Education & Research, LLC. The Center conducts research into all aspects of nutritional magnesium and attempts to inform the world of their findings. Dr. Volpe is Professor and Chair of the Department of Nutrition Sciences at Drexel University College of Nursing and Health Professions. She is a nutritionist and exercise physiologist whose work on obesity and diabetes prevention, body composition, bone mineral density, and mineral metabolism and exercise represent more than a decade of consistent funding. 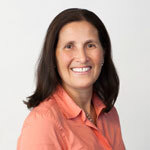 Prior to beginning her appointment as Professor and Chair in January 2011 at Drexel University, Dr. Volpe was on faculty at the University of Pennsylvania from 2004 to 2010. Prior to that appointment, Dr. Volpe was on faculty at the University of Massachusetts from 1994 through 2003. Nature Made® has developed quality vitamins, minerals and supplements for more than 45 years. Nature Made adheres to strict manufacturing standards and was the first national supplement brand to have a product verified by the United States Pharmacopeia (USP), and is the national supplement brand with the most products carrying the USP Verified Mark—verification that products meet stringent quality criteria for purity and potency. Learn more at NatureMade.com/USP. This complimentary 1-credit continuing education webinar is brought to you with support from Nature Made®. Please note that Nature Made provided financial support only and did not have input into the information provided in this course. Andrea Rosanoff, PhD, reports the following relevant disclosures: grants/research support from Adobe Springs Water Co., LLC; consultant to Nutranext, NeoLife International, LLC and Jigsaw Health; honorarium from Pharmavite, LLC; and royalties from NutraNext and MG Products, LLC. Stella Volpe, PhD, RDN, ACSM-CEP, FACSM, has no relevant disclosures to report. Both have certified that no conflict of interest exists for this program. View our disclosure policy.